"Accidental" passive solar design. There are about 40 houses in our neighborhood of similar design with large window walls. By accident of street layout and orientation of houses on lots, only 5 or 6 of these houses have their windows facing in the right direction, i.e. south. Luckily, ours was one of these. Orientation -- South-South-East (SSE) -- 30 degrees east of "solar south." Insolation penalty for SSE orientation -- approximately 14%. 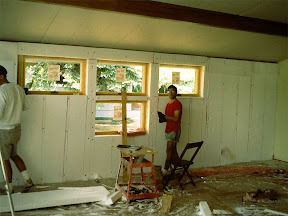 240 square feet of SSE window glass; effective aperture approximately 200 square feet (due to large overhang which blocks some sun even in winter). If we de-rate by 14% to allow for SSE orientation, our 200 square feet of SSE-facing windows are equal to 172 square feet south-facing glass. 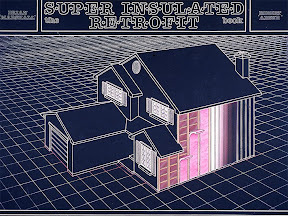 SSE glass type -- Triple glazed, double low-e coated, argon gas-filled “super-windows” (2003), R-7.5 (center of glass). 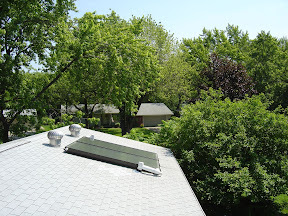 Units facing south have a solar heat gain coefficient of 55% and thus are “tuned” for solar gain. "Solar fraction" is approximately 40% (sun provides approximately 40% of house heating requirements). This performance is possible because house has been super-insulated and heating load is very low. 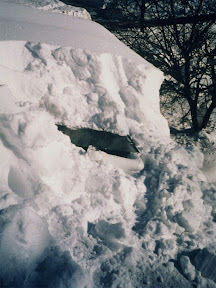 No thermal mass (not needed; house does not overheat). General rule is if south-facing window area is over 12% of floor space, thermal mass is needed. We are at 9.3%, assuming south-facing equivalent of 172 square feet of glass (see above). 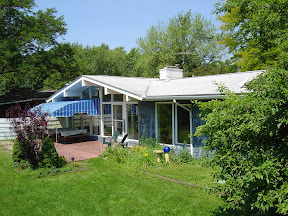 Summer sun control -- overhang and awning. 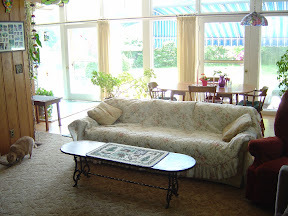 Daylighting -- during daylight hours sunlight adequately illuminates most rooms without the need for electric lighting. Net-metered – National Grid supplies us power when we are not generating enough; we supply National Grid when we generate more than we use. Cost: $27,000. After NYSERDA incentives and federal and state tax credits = $9,000 cost to us. 15+ year simple payback. Approx. cost $5,000; installed with volunteer help and assistance from local plumber; some parts used/recycled. Provides 65% of our hot water needs. Three season system – really no production November - January. Note snow cover on the week we had seven feet of snow. Yes, we use a clothes line! 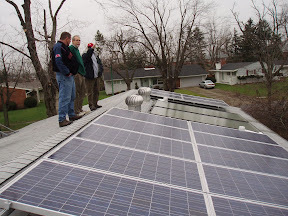 When our PV system does not supply all of our electricity, we buy 100% "New Wind Energy" from Community Energy at: http://www.newwindenergy.com or call 1-866-WIND-123. 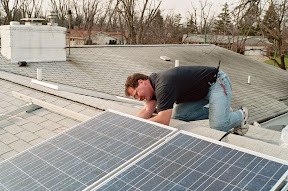 This option costs 2.5 cents per kilowatt hour. It will add a few dollars to your electric bill -- a small price to pay to quit the coal and nuclear habit and to promote clean new wind power development in New York State. 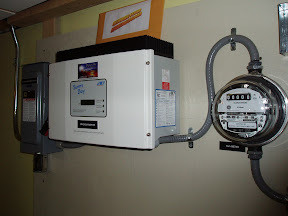 Alternative product: Energy Cost Monitor by Blueline, (http://www.bluelineinnovations.com/) $135. 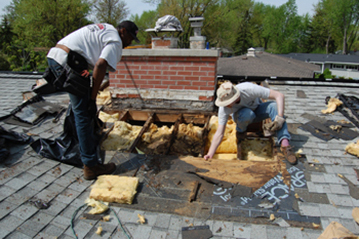 Insulation around chimney with high temperature ROXUL AFB (2,150 degree F) non-combustible mineral wool batts, eliminating thermal hole and losses around chimney. 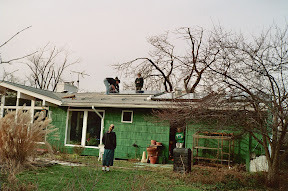 New super windows (2003) with center of glass R-value of 7.5, tuned for solar gain on the south side (see passive solar section for more detail on all windows). Draft-free, tight but not-too-tight, envelope (0.33 air changes per hour as per blower door test). 95% efficient natural gas furnace. Lower space temperatures are comfortable in our house because of radiant heat from sunlight, warmer wall temperatures due to super-insulation, and zero drafts. Open windows, cross ventilation, overhangs, awning, white roof, and use of ceiling fans and portable fans instead of air conditioning. 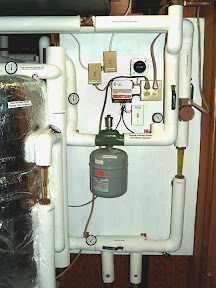 Solar hot water system substantially reduces natural gas water heating load. 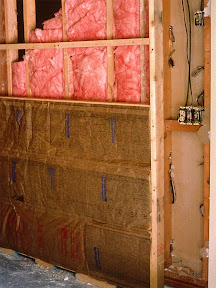 Insulating blankets on natural gas water heater. 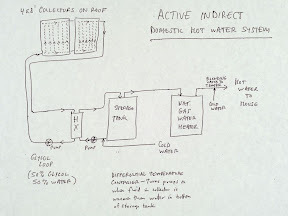 Adjustable flow shower head (we use lower flow in winter when solar hot water system isn’t producing "free" hot water). Horizontal axis Energy Star clothes washer. Usually wash warm; rinse cold. Cold wash, cold rinse uses no hot water. Always use "water miser" feature when operating dishwasher. Leave warm water in bath tub until it cools in order to help heat and humidify house in the winter. Only one refrigerator/freezer and most efficient model available – 100% more efficient than older model just replaced. Additional switch on microwave to eliminate "phantom watts" – but still have 70 watts of power consumption when everything is “off” – need to track down! Computer energy saving "sleep modes" enabled, and computers switched off when not in use. Dishwasher operated with "water miser" and "no heat dry" settings. Horizontal Axis Energy Star clothes washer. 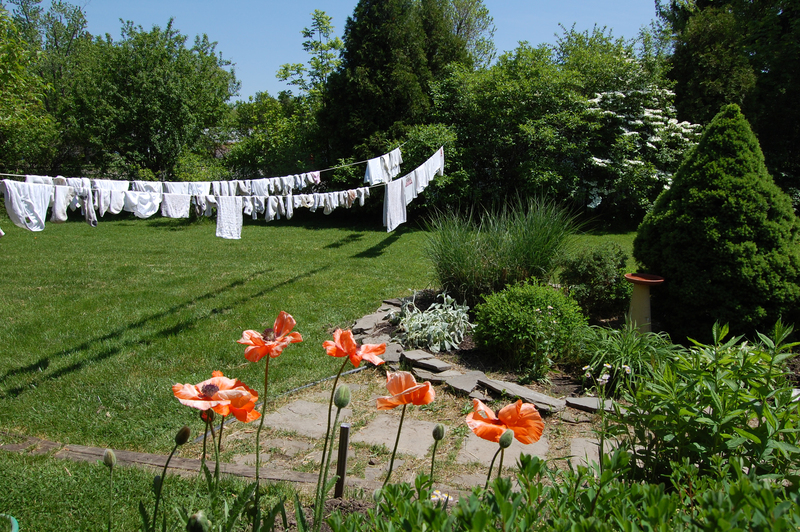 Minimize use of gas dryer by using a clothesline in summer and winter. Fluorescent lighting in all rooms -- including 13 compact fluorescent lamps in table and hanging lamps. Conventional chandelier with 375 watts of incandescent bulbs replaced with Tiffany lamp with 45 watts of compact fluorescent lighting (which produces more light). One, two, or three 15 watt compact lamps can be used at a time. Minimum of 88% savings over incandescents. Compact fluorescent lamps last 10,000 hours and produce four times as much light per watt as do incandescent bulbs which last only 750 hours. Thus, an 18 watt compact fluorescent lamp will produce as much light as a 75 watt incandescent and it will last 13 times as long. Lamp costs are less over 10,000 hours of operation, i.e. one compact lamp vs. 13 incandescents. Thus, you will save $62.70 for every compact fluorescent lamp you install over the lifespan of the lamp. Not bad for a $3 lamp! 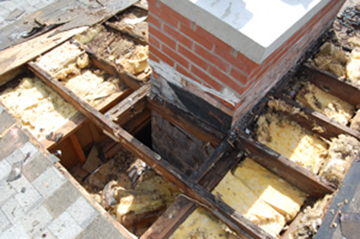 Removal (delamping) of unneeded fixtures. Additional light switches installed in basement to provide lighting zones (allowing use of basement without turning all lights on). Don't water lawn (allow grass to go dormant in summer). 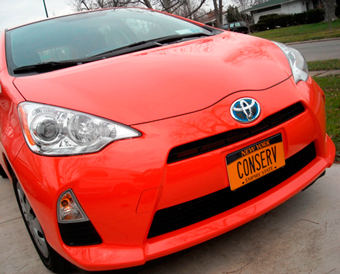 Relatively high mileage smaller cars -- 42 and 50 mpg (highway driving), the former a 2001 Toyota Echo and the latter a new Prius C which gets over 60 mpg around town in warm weather. Drive each car average of 5,000 miles a year (much less than national average but still too much). Simpson’s vegetarian diet saves energy and reduces greenhouse gas emissions because meat production is energy (fossil fuel) intensive. Ten pounds of grain must be produced and fed to a cow to produce one pound of meat. All that takes energy and other resources as well as produces air and water pollution When we eat the grain directly, we can eliminate all that inefficiency and waste –as well as cruelty. Cows are also responsible for release of methane, another greenhouse gas. Besides recycling, the Simpsons buy products which are made of recycled material, e.g. printer paper, paper towels, toilet paper, napkins, and tissue paper. Recycling saves energy and buying products made of recycled materials “closes the loop” by creating a market for recyclables. 1. Purchase of wind power to meet 100% of home electrical needs not supplied by our PV panels. 2. 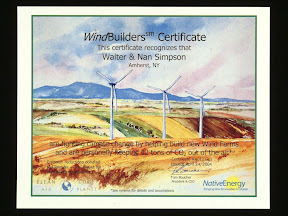 Purchase of an additional 15 tons of CO2 emissions reduction from NativeEnergy, www.nativeenergy.com. Cost: $150. Do annually. NativeEnergy achieves emissions reductions by purchasing “green tags” associated with the development of new wind turbines or farm methane generation. We calculated that we need 3 tons of carbon dioxide offsets to cover the operation of our van and we allowed for an additional 12 tons of mitigation to offset home natural gas use (heating, hot water, cooking, etc. ), gasoline for our two cars, and other consumptive activities. We rounded that off to 12 tons in order to begin mitigating energy and CO2 impacts associated with occasional air travel, material goods purchases, and other energy-related consumptive activities. 3. 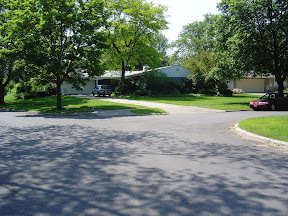 In 2011 we had our driveway replaced. After considering greener options (and rejecting them because of potential problems associated with permeable driveways in colder climate and our inability to find experienced installers) we went with a conventional concrete drive. We purchased 15 tons of CO2 offsets to cover the emissions involved with making the cement and laying the drive way. 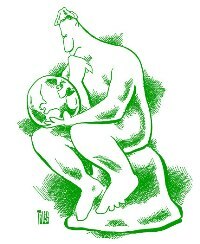 Click here for calculation showing 7.09 tons of CO2 were released in manufacturing the concrete used in our driveway. 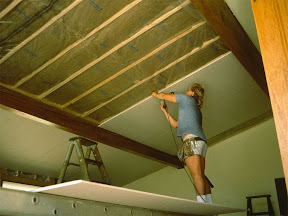 We rounded up to 15 tons to at least partially allow for the other materials and installation.